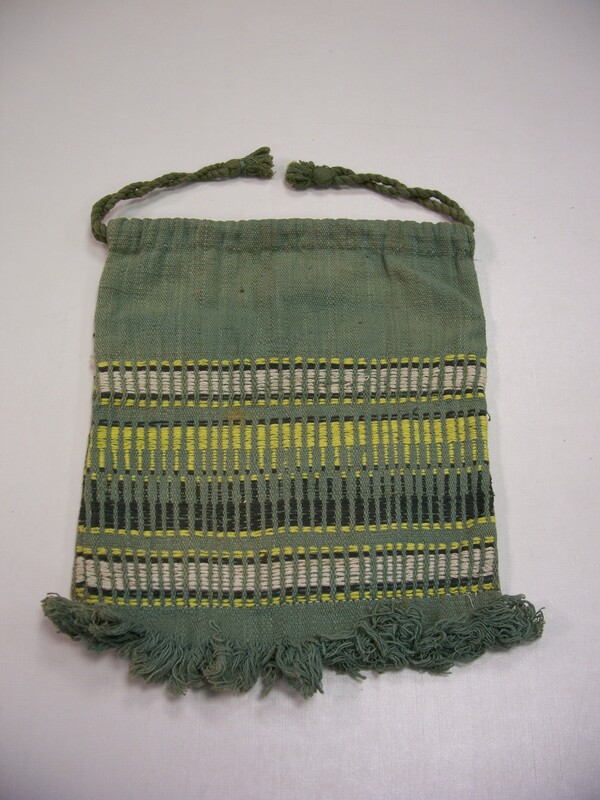 This week’s Object is a rather faded and grubby green woven bag, which accompanied the Archive of Barbara Bruce. Archives received in Special Collections often contain objects as well as documents. Sometimes, as in this case, these survivals can shed new light on the archives that contain them. Barbara Bruce (1906-1976) was a Quaker, sculptor and volunteer nurse and relief worker in India in the 1940s. She immersed herself in Indian life, culture and ideas, and in particular the philosophies of Gandhi, spending time at Sevagram, the ashram and village community which he created. Barbara returned to England permanently in 1950, but kept in touch with her many friends and colleagues in India. Her contacts included David Hoggett, founder of Commonweal Library, which was based on Gandhi’s idea of sarvodaya: the good of all. 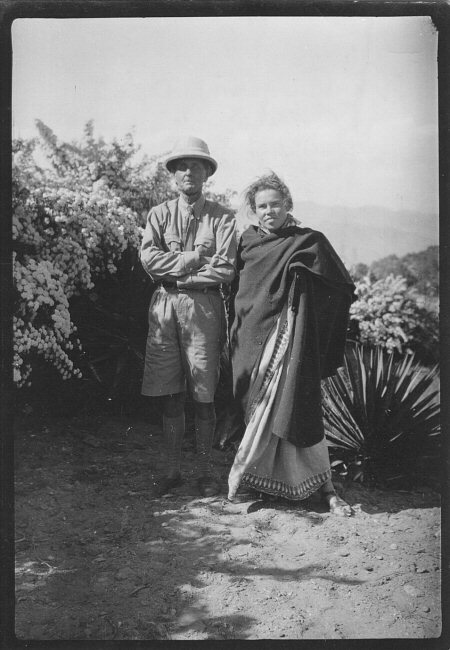 Barbara Bruce in Almora, Uttar Pradesh, c1940, with the anthropologist Walter Evans-Wentz. She described herself in this photo as a “wild woman of India”. Barbara’s Archive is a rich collection of letters and photographs which vividly illustrate her interests and friendships in India. It also includes fascinating postcards, like this one. “It’s a reasonable assumption that Barbara wove it herself. During early 1942 she spent time at Khadi Bhangar rural spinning centre in Narsinghpur in the Central Provinces. The charka (spinning wheel) and khadi (handspun, handwoven cloth) were symbolic of the Gandhian idea of village development and self reliance upon which the goal of Indian independence was based. Barbara’s friend and fellow nurse Margaret Jones wore khadi, as did Barbara. She reports the reaction from her English colleagues at a hospital in Bombay in a letter from April 1941: ‘See! She wears khadi – she is anti-British!’”. Thus the little bag symbolises Barbara’s engagement with India, with Gandhi’s ideas and her commitment to them in her own life. 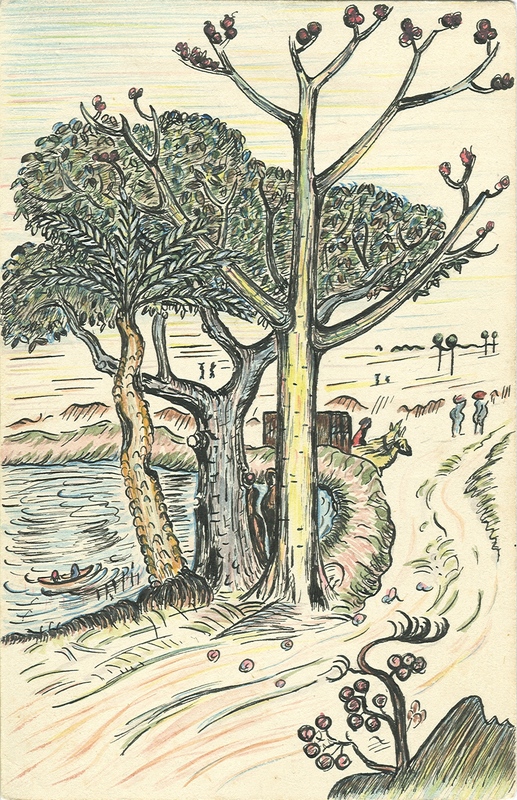 Find out more about her extraordinary story on the PaxCat blog, the Archive web page, and the entry for the Archive on the Archives Hub.